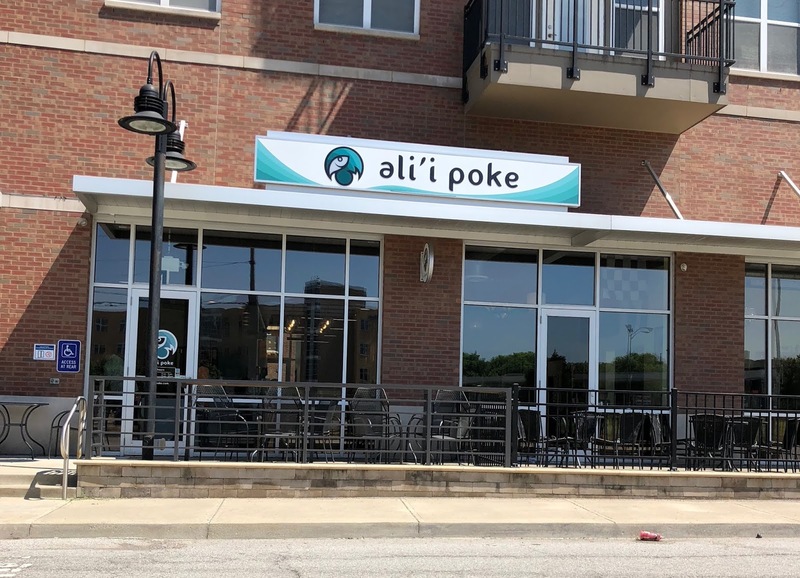 I really enjoy poke (it’s pronounced “poh-kay”) and am excited to see new options springing up around Indy. 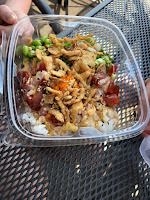 So poke is sort of like a deconstructed sushi roll in many ways—the star of the dish is meant to be the fish, and it is usually served raw and marinated. You choose your base (rice, greens or nacho chips) and then you choose your proteins, your toppings, and your sauces. Or at Ali’I poke, you can go with one of their signature bowls, in which they have created a bowl of ingredients that they think go well together. We built our own. 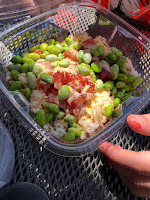 At Ali’I, you get a small or large bowl ($9.50 or $12.50). In a small bowl, you get two scoops of protein and in a large, you get four. I was really torn because I like to get a scoop of tofu in my bowl, but only one scoop of fish seemed inadequate. And in the interest of blogging, I also wanted to try the salmon. So, in order to write the most thorough post possible (it’s your fault I got such a huge portion), I got the large. However, for future reference, you really don’t need the large unless you’re really hungry—the portion they give is quite generous. I had two scoops of the marinated tuna, one of the marinated salmon, and one tofu. The kids both got the small and both got all tuna. First of all, I think the fish quality is slightly better than the other poke place I have tried in town. The pieces are cut a bit bigger, and they give you more in a scoop. I think the bigger pieces make it harder to hide fatty bits. Both the tuna and the salmon were very good, and I only came across one piece that was a touch fatty. The tofu was nice big chunks too, and because they don’t mix the proteins up in the sauce (which has its good and bad points), it stays that way. As for the base of my bowl, I got half sushi rice and half greens, and I think at this place, I would just stick with the rice in the future. 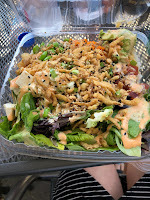 I really like greens in poke, but these were bigger, harder pieces of lettuce (mainly romaine), and weren’t as good as softer mixed baby greens. Just harder to eat I guess. 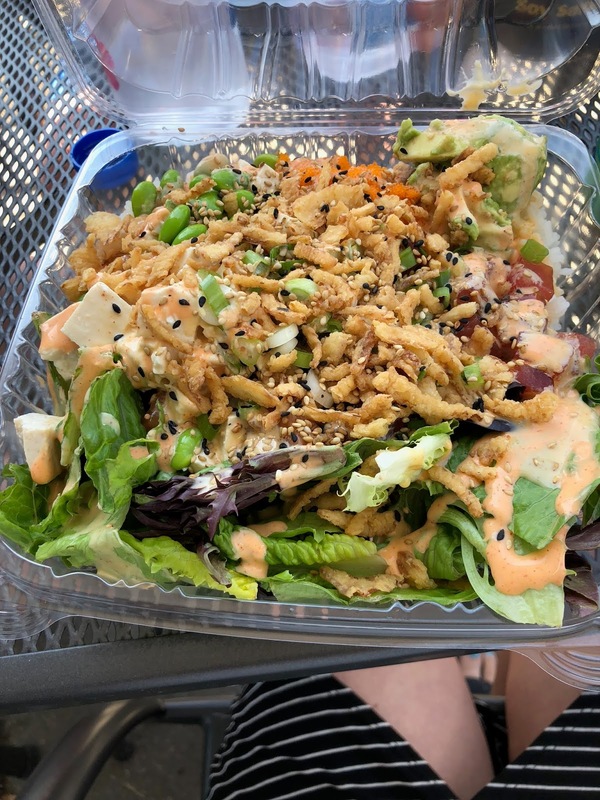 As far as toppings, I went with edamame, sesame seeds, crispy onions, avocado, and scallions. I also like that they don’t charge you extra for anything (even the avocado), so you know just what you are paying from the start. There are a ton of sauces and I had a hard time choosing. I ended up getting some of the creamy miso and some of the spicy mayo, and both were good (they will let you taste any that you want as well). My daughter did the creamy miso and the sesame shoyu and I think it might have been a little better. I would also like to try the sesame vinaigrette. There is also classic unagi sauce and honey wasabi. (I told you there are a lot of choices!). All in all, we quite liked this place, and to be honest, it is not much further than driving to Carmel, which is our other regular poke haunt. We were torn amongst the group as to which we liked more, but I think because the fish and the portions were a bit better here, I would choose this one, although I will still frequent both. This place was doing a bustling business on a week day, and I think may be a favorite of the staff at the IUPUI campus. 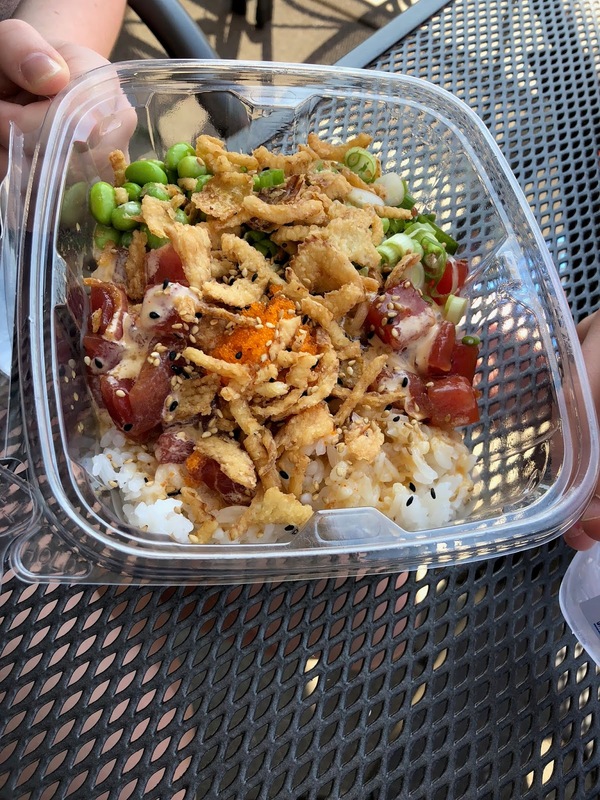 I know there are some other places offering poke bowls as well—have you had any of them, and what did you think?